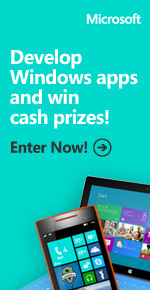 Shayne Boyer: Develop Windows 8 & Windows Phone Apps and Win Cash! From February 1 through June 2013, publish a new Windows 8 or Windows Phone app and enter my sweepstakes page to win up to $1000 in cash prizes. WHAT?!?! Pretty cool right. Get extra $$ for what you are already doing. Publish you app in the store the go to http://spboyer.me/appsforcash and submit your app. $1000 $500 $250 Follow me on twitter @spboyer and let me know when you submit it and I'll personally look at the app and give it a review and let all my friends to give it a look as well for extra exposure. If this is your FIRST Windows Phone App you may qualify for a Free Nokia Lumia Phone.